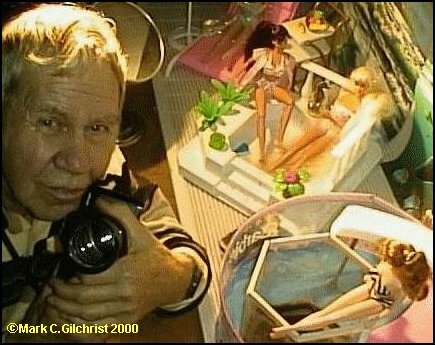 Thursday, June 26, 1998 -- Saco, Maine - Until we reach the top floor and the tiny studios in Al Carbee's twenty-two room house, there is little reason to suspect that this man spends most of his waking hours photographing Barbie dolls. As Carbee shows me around his home, we duck and climb and wind our way like a pair of spelunkers. The building is well over one hundred years old (in places) and has been modified, appended, annexed, carved out and redone so many times, it is hard to see where the original structure (a barn) is. It takes us almost an hour to tour the twenty-two rooms, each one just large enough to hold a few pieces of furniture or various tools and equipment and a pile of art books or two. This house is the story of Al Carbee's eighty-four year life; the many twists and turns, the projects unfinished, the hidden potential, the artwork on every wall. Tour his home and you will see the soul of this creative man, in a fascinating collection of media; the many, many photographs he has taken in his life, pastel portraits he has drawn, laser-copied magazine covers and even dozens of completed and mounted jigsaw puzzles he and his wife of fifty-four years would piece together. "She didn't like my art," Carbee says of his late wife. "She wanted me to be normal, to smoke cigars and go watch baseball games. She didn't know that I couldn't just stop being creative for no reason." He has taken several thousand self-portraits, an extremely difficult subject as one must have incredible patience. He has scrapbooks full of photos of himself; Al Carbee working on projects, Al painting, Al driving, Al walking, Al measuring a doorway - each of them so crisp and free of flaws you would think that he had his own photographer along with him twenty-four hours each day. As I write this, remembering the photos, I see an uncanny resemblence to Truman Burbank and believe me, this is eerie. placed with Barbie and photographed by Carbee. It is frustrating to see the talent Carbee has, knowing he never used it professionally. During World War II he worked in the medical corps developing X-rays. He went to art school and was offered a portrait job in New York City but he moved to Maine. "I'd be scared to go to New York," he says. "I guess I wanted to be like Norman Rockwell." This timid, creative man spent his career using his technical talents, working as a photographer for a print shop, selling and renting go-karts and even clerking at a Fotomat booth in his seventies. At Fotomat, Carbee's customers would ask him to take their portraits and he would do so in his home, charging only five dollars. Looking through scrapbooks of his beautiful, technically immaculate work, it is no wonder his services were so popular. "I was happy with every one I did," he says of his portraits. "It was an exciting life I was living." Most of Carbee's subjects were women and it is obvious he enjoys photographing that gender. 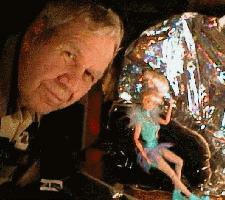 Al Carbee beside his favorite model. "Look at her...she looks like she could get up and speak to you." Carbee keeps his photography studios on the top floor of his house, around a room where he raises guppies - thousands of them - to sell to local shops. His recent affectation for photographing the "perfect figure" of Barbie may seem odd, but there is true creative talent in Al Carbee. Though he never earned a living at it, he is an artist. During the past three years, Carbee has taken thousands of photographs of the same girl, propped, twisted and dressed in garments sewn by him. 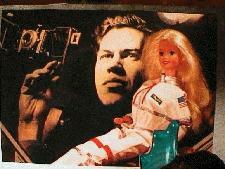 He builds elaborate sets, showing Barbie at the Beach, Barbie in space, Barbie at home - Barbie everywhere. He spends hours and hours constructing sets, perfecting lighting and peering through his view finder. 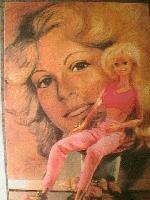 Barbie is the perfect model; patient and quiet, perhaps the only model who (that) is as patient as himself. "I can treat her like she was a live person," Carbee says, showing me some of his favorite dolls (he has nearly fifty of them.) "She looks like she could get up and speak to you - They're all my friends." Look how patient they are. If they were live people, think how much trouble they would be." It is rewarding for an artist to have someone buy their work and Carbee is looking for an outlet to offer his. He is also reviving his studio for human portraits. At 84 years old, some might say it is a little late to begin a new venture, but Al Carbee has his camera loaded and ready. Before I leave, Carbee pulls out his wallet and shows me photographs of his "kitties". There are five of them; Spooky, Midnight, Patches, Ditto, Peewee and Timothy and he points to each one as he names them off, as if they were the children he never had. "My wife never wanted children. Besides, we had nieces and nephews by the bushels," he says. Still, children would give Al Carbee grandchildren and some company at this time in his life. Maybe so, maybe not, but as I say goodbye and he thanks me for coming, I remember the beautiful portraits he took and as I walk away from his empty home, I wish that a real person would sit in front of his camera again.